April 13th, 2014 – Pi Chapter Welcomes the Alpha Phi pledge class! The Alpha Phi pledge class has become a part of Mu Beta Psi Pi chapter! They have also become Brothers of Mu Upsilon Alpha. Welcome! 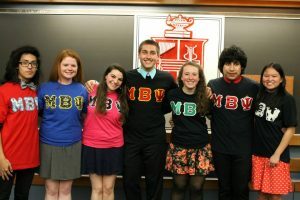 From left to right: Christian Rios, Lindsay Wilkins, Ashtyn Greenstein, Anthony DeCristofano, Christina Vecchio, Reuben Rios, Casey Lau. 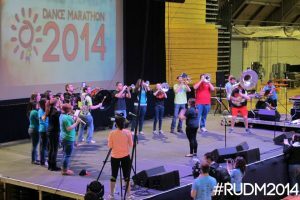 In an annual effort to raise funds “FTK” or For the Kids, the Pi chapter Brothers joined in the opening festivities of Dance Marathon at Rutgers University which was held on Saturday, April 5th to Sunday April 6th. They played the school fight songs, such as Colonel Rutgers and The Bells Must Ring as well as some familiar stands tunes heard at football games during the fall. The Brothers were also welcomed to singing the school’s Alma Mater. Overall the Brothers really enjoyed being apart of this wonderful event, which raised $622,533.98 this year and will be donated to the Embrace Kids Foundation.